Launceston WW1 100 | Launceston Then! An exhibition of remembrance for Launceston through WW1, including stories of the fallen, was opened on Friday 9th November at Central Methodist Church by the Reverend Malcolm Jones. Those attending could view the 94 stories of the Launceston Fallen and that of the fallen stories for the eighteen surrounding parishes. 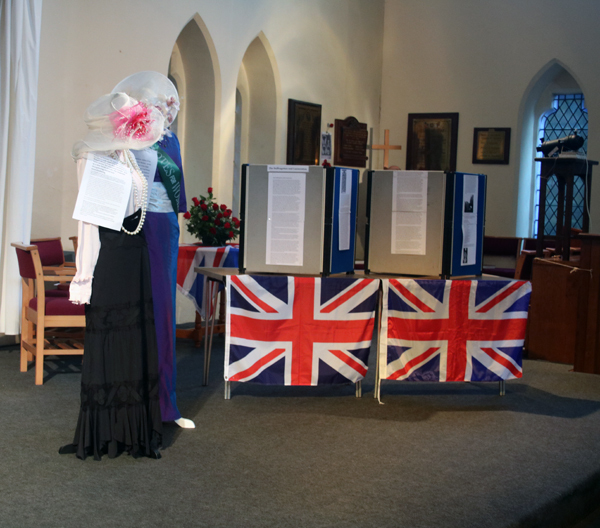 The exhibition was based around the information Roger Pyke and Jim Edwards researched and collated in a book called, Commemorating Launceston and District and the Great War presented on the night. The event itself ran from Friday to the centenary Remembrance Sunday 11th November and was organised by the Launceston WW1 100 Group, Sue Vernon and Peter Vernon, Andrew Fuge, Roger Pyke, and Cherry Pyke and Phil Parsons. For others, they discover new facts about a member of their family, ”Thank you for this exhibition and what you found out about my great uncle bill”. Event organiser Phil Parsons wishes to express his thanks to the Central Methodist Church volunteers for their assistance in making the event so successful and the support of the South Petherwin Parish Magazine and the Papillon Fund. Above Roger Pyke and Jim Edwards show off the ‘Commemorating Launceston and District and the Great War’ book at the event, the proceeds of which went to help fund the exhibition. The run of 100 books have sold out.